(Virgin Records) Years ago I became aware of Tool and although I wasn’t too impressed at first, their music really grew on me. Tool has an extremely dedicated following, so this new band fronted by Maynard James Keenan has some high expectations to live up to. 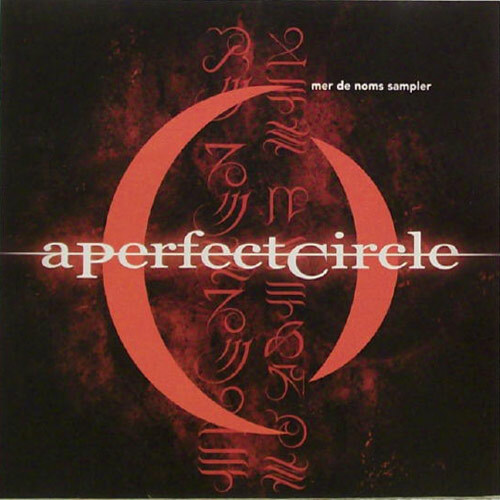 The album’s title, according to the press kit, is French for “Sea of Names”, and the majority of the song titles are people’s names, including my own (“Thomas”). The fifth track, “Orestes” mentions the band’s name in the lyrics also. This album seems to explore more varied musical territory than Tool did. Many of the songs are treated with soft acoustic guitars and then sudden unexpected crescendos of metal edged monstrosity. Piano, violin and beautiful vocal harmonies weave together to create a somewhat Gothic and exotic interlude on “Renholder”. I heard parts of this album that reminded me of Pink Floyd and even Jethro Tull. There’s even a song that oddly enough somewhat reminds me of Peter Gabriel’s material. In general, this band seems mellower than Tool’s previous stuff, but here and there A Perfect Circle’s ”Mer de Noms” totally rocks out.